As Papua New Guinea celebrated 30 years of Independence on September 16, 2005, and as we all joined hands to “sing of our joy to be free”, there was not much thought for the man who composed our National Anthem. 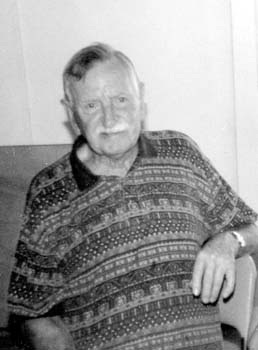 His name is Thomas Shacklady (pictured above), who died of a stroke early Wednesday January 25, 2006, in his home in Sydney, Australia at the age of 88. He is remembered by many Papua New Guineans as the legendary bandmaster of the great Royal Papua New Guinea Constabulary Band from 1964 to 1982. "His name is embedded in Papua New Guinea's history,” said Prime Minister Sir Michael Somare. "He will be remembered with pride for a very long time - as long as every school child stands in the morning assembly to sing the national song, or as long as our national sporting heroes stand tall at a podium." The RPNGC Band gained international acclaim under Shacklady’s leadership and toured many countries including Australia, New Zealand, the United States, South East Asia, other Pacific Islands, and in 1970, the Edinburgh Tattoo in Scotland. But it is through the words of the Papua New Guinea National Anthem that Shacklady has been immortalised. Shacklady was a World War 11 hero who fought with distinction for the British Royal Marines. For his war service he received the 1939-45 Star, Italy Star, Africa Star, Defence Medal and War Service Medal. Like thousands of others being discharged from the forces, Shacklady found that work was not easy to find and had several jobs over the next three years; night-watchman, butler, and working as a freelance musician. He ran and worked with several private dance bands, while playing bass trombone with the BBC's Scottish Orchestra. It was a couple of years after this while in London that Shacklady saw an ad in a newspaper calling for volunteers for the Australian Defence Forces and on September 21, 1951, he enlisted in the Australian Army. The family took passage aboard the RMS Asturius sailing from Southampton on December 1 for Melbourne, Victoria. On arrival at Melbourne they spent four or five days being processed before being sent by train to Adelaide in South Australia where Shacklady joined the Kensington Central Command Band based at the Inverbrakie Camp, Woodside. Over the next six years Shacklady trained three bands a year from the National Service intakes. In 1953 he was promoted Corporal and added the EIIR Coronation Medal to his awards. In early 1955 he was raised to the rank of Sergeant, and was awarded the British Empire Medal for his service to the formation of NS bands. In 1957, Shacklady was transferred to the Papua New Guinea Army band based at Port Moresby and was promoted to Warrant rank. He returned to Australia in 1959 and for the next five years was Bandmaster of the Enogerra Base, Army band, in Brisbane. He also took on the unenviable task of managing the base's swimming pool. He was discharged from the Australian Army on March 6, 1964, and on the 14th, commissioned into the Papua New Guinea Constabulary as Bandmaster with the rank of Inspector. One of Shacklady’s fondest memories occurred at the Mount Hagen Show in 1965, an annual event involving the gathering of tens of thousands of New Guinea's tribesmen in the highland township. 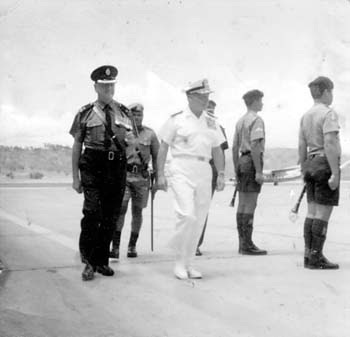 The event was officially opened by the Earl Mountbatten of Burma who was reported in the press as being highly surprised and delighted that the Band of the Papua New Guinea Police, in one of the most primitive and remote locations on Earth, was playing the Earl's personal march, the Preobrajenski. The official procedures were halted whilst the Earl walked over to the Band to congratulate Shacklady and comment that he had correctly assumed that the Bandmaster must be an ex Royal Marine. The RPNGC Band gained considerable recognition under Shacklady’s direction, touring many countries from 1967 to 1975 including Australia on several occasions, New Zealand, the United States, South East Asia, other Pacific Islands and in 1970, the Edinburgh Tattoo in Scotland. In April 1970, he was transferred to general police duties at Rabaul on East New Britain for a year and then returned to Kila where he remained as Bandmaster until 1975. This was the year that PNG was granted independence from Australian administration and was to be the highlight of Shacklady’s career. With Independence, Shacklady was promoted to Chief Inspector and Bandmaster and as such was responsible for transferring the Band to a new training establishment at Bomana, while the new independent nation of Papua New Guinea adopted “Arise All Ye Sons of the Land”, composed by Shacklady, as its National Anthem. The national song calling the sons (and daughters) of Papua New Guinea to arise and to “sing of our joy to be free” was adopted by the Constituent Assembly to be sung on Independence Day. Unlike the National Flag and Emblem which were adopted four years earlier, the National Anthem was not decided until just a week before Independence Day. It was even mooted that there would be no national song until after Independence, even though this song and others had been submitted in a nationwide competition well ahead of Independence Day. The National Executive Council decided only on September 10, 1975, to adopt the song whose words and music were composed by Chief Inspector Thomas Shacklady, the then bandmaster of the ever-popular Royal Papua New Guinea Constabulary Band. On June 11, 1977, for his services to PNG he was invested a Member of the British Empire (MBE), and received the PNG Police Service Medal and PNG Independence Medal to add to his other decorations. 1978 saw him promoted to Superintendent and Director of Music RPNGC. In 1979, Shacklady purchased some $A5.00 tickets in an Art Union (raffle) run by the Mater hospital in Brisbane, the grand prize being a fully furnished luxury home. The winner of the 1979 home in the brand new suburb of Springwood was one Superintendent Thomas Shacklady BEM MBE! 1980 saw Shacklady promoted to Chief Superintendent, Director of Music RPNGC, the position he held until 1982 when he retired from the police, returned to Brisbane and settled in his prize home at Springwood with his family. Three years later they sold the home at Springwood and moved to an ocean side home at Redland Bay. Sadly, in September 1985, Danae, his wife for 48 years, quietly passed away at their bayside home. With both his sons married and fled the nest, Tom sold the family home in 1991 and purchased the small but comfortable unit in the Forest Place retirement village at Durack, a southern suburb of Brisbane, where he now lives. A long time member of the RMA Queensland, Tom could no longer attend meetings and take part in the social life of the association but was kept informed of its activities by their monthly journal and visits by another old member, Roy Leaney, who lived close by. He received regular visits from his son Paul, with his three children Zoe, Katie and Suzie, when he visited Brisbane, and from Noel and his two children, David and Justine, who also live in Brisbane. Thomas Shacklady was a really good composer, he even was the inspiration for too many artist from this industry... for example Jose Maria Zeledon and Jose Maria Bonilla Ruano got their inspiration from Mr. Thomas. A very big thanks to the composer of us the Papua New Guineans to the late thomas shacklady and his families, because of him, now we have a national anthem to sing for our independent Country Papua New. It's a very special and heartfelt anthem - thank you Thomas Shacklady! The only national anthem I consistently remember! I also remember the PNG Flag song, but have never known the composer or found it online since. Late Thomas Shacklady - Thanks for the PNG National Anthem. I would like to wholeheartedly thank you for all your contributions to my country and your once called home - Papua New Guinea. May you rest in PEACE until we meet again on the Judgement Day.